If you need some inspiration; Lis and this post are going to give it! 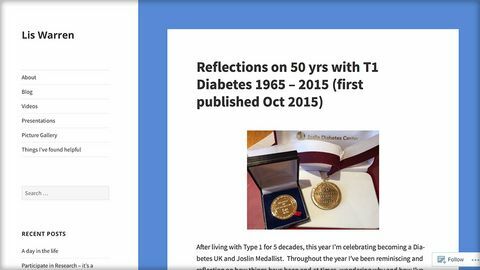 A well written post about living and embracing diabetes over the past 50years. Warning: this review may be a little biased as I think Lis is great, an amazing lady who's been through so much and come out the other side smiling and still doing so much for the Diabetes community. Lis takes us through some tips on how to live well with Type 1, and places a lot of importance on humour and attitude which seem (to me too) to be the key. She writes about the NHS, the Cure and how technology has changed since her diagnosis.